Today was just going to be another lazy day, but around noon I decided to go	and take the helicopter tour that I had booked. I had bought the ticket from my holiday reps at my hotel, and could use it anytime during my holiday. I drove to where the tours operated from, and after a short wait, it was time to go. I had chosen the flight which takes you over Disney World, SeaWorld and Discovery Cove. There were many more, but I thought this would be a nice trip. We took off and headed towards Disney World. 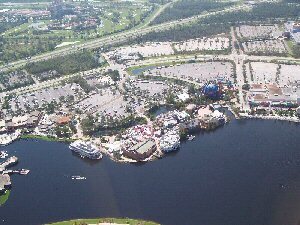 After a few minutes flight, we arrived and were flown over the whole of the Disney area, seeing Blizzard Beach, Typhoon Lagoon, Downtown Disney and EPCOT all from high above. Seeing it like this really gives you a good idea of how big the place is. After the flight round Disney World, we headed back up I4 to SeaWorld and Discovery Cove. 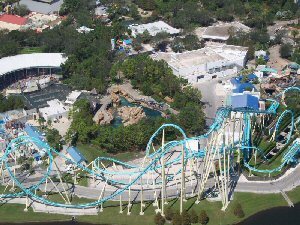 Flying over SeaWorld was great, I was able to see Kraken in all its glory from a view that I would not normally see a coaster from. Seeing Discovery Cove gave me a glimpse of what I would be doing when I go there. After this we headed back to the tour base, where we finished our tour. Total time was around 15 minutes. I had not planned on doing this, but I was glad that I had the opportunity to do it. 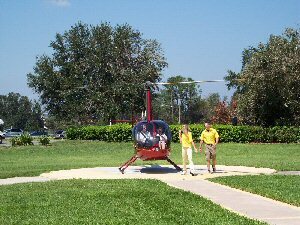 A very nice way to see some of Orlando. I got back to the hotel and spent the rest of the day in the pool.